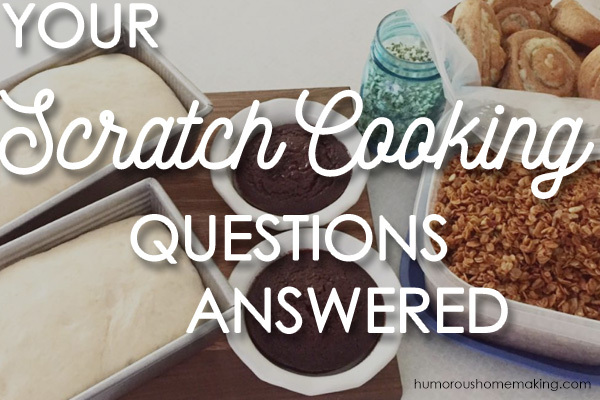 You are here: Home / Food / Your Scratch Cooking Questions, Answered! 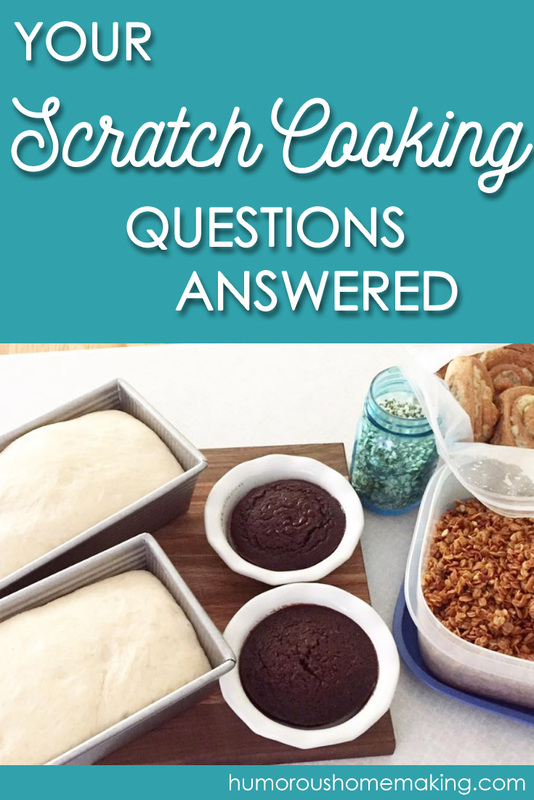 Your Scratch Cooking Questions, Answered! I tend to get a lot of questions about how I am cooking from scratch for my family, especially over on Instagram, where I post weekly meal plans, meal prep, favorite cookbooks, etc., as well as pictures of lots of food! Today, I’m answering a handful of those questions and my hope is that this is a help to y’all as you brave the cooking from scratch terrain in your own kitchens. From Katie: I know you don’t like making broth, but is there anything else you don’t like cooking from scratch? In case y’all haven’t heard the story of why I don’t make my own broth… and why I buy organic broth in cartons from Aldi… let me give you a little background. Have any of y’all ever had a traumatic pregnancy-related food experience? Well let me just tell you, I did! When I tried to make bone broth while I was pregnant with Andy, I was literally so nauseated I thought I was going to pass out. It was the worst! Andy is 6 years old and to this day, I cannot stand to smell it, see it, simmer it, etc. I know it’s irrational, but it’s also very real! But to answer the question, I cooking from scratch is a passion of mine, which means I can cook almost anything from scratch. But sometimes, I press the easy button. For example, I used to make homemade yogurt all the time, but I can get very affordable, organic homemade whole milk yogurt from Aldi. It’s a huge time-saver and while it isn’t the BEST option, it’s a really good option for our family during this busy season. A few other things I don’t usually cook from scratch include tortillas, crackers, and marinara sauce. I do enjoy making my own tortillas, but I usually take the easy route. When I tried to make my own crackers, my children said, “Mom, please don’t do that again! We all like the round crackers and the oyster crackers from Trader Joe’s (which actually have pretty clean ingredients). I also don’t make marinara/pasta sauce because Aldi has an organic marinara that is amazing. I sometimes make homemade pasta – not always, but about 25% of the time. The rest of my pasta I purchase from Aldi. Amy asks: What is your favorite meal to make from scratch? Hands down my favorite meal to make when I am cooking from scratch is… Sausage Gravy and Biscuits! This is one of the few things I make that I don’t actually have a recipe for. I watched my mom make it since I was itty, bitty so I’ve just got it memorized! For almost everything else, I don’t want to mess it up so I stick to recipes, but I LOVE homemade biscuits with sausage gravy. I get asked a lot if I make my own sausage, and like most things, the answer is sometimes. Some friends from church have a farm and they sell delicious pork sausage. It makes the most sense to buy from them right now. Growing up, we had canned sausage. I can’t even explain how good it was. I know it sounds weird but it was so delicious. From Starlyn: When do you use bacon grease and when do you use butter? Which do you prefer? Great question – I love cooking with bacon fat so I absolutely always save my bacon grease! I reserve the fat to fry eggs, roast Brussels sprouts, to pop popcorn, to pan-fry chicken, etc. Never throw away your bacon fat! But I prefer butter on vegetables like broccoli, cauliflower, green beans, peas and carrots, etc. And I always put butter on breakfast foods like pancakes and waffles – butter in ALL the waffle crevices, y’all! And I obviously love butter on all the basic butter vehicles such as bread, muffins, scones, biscuits, etc. My butter of choice is Kerrygold which I can buy very affordably at Aldi. Katie T: Can you share some time-saving tips and one-pan (or one-pot) meal ideas? I love cooking from scratch but don’t have much time because I have a 23-month old and 2-month old twins. First of all, Katie is a rock-star – you go girl! Some of my favorite time-saving tips… Always make two of every meal you make! If you are making a pot of soup, double it and freeze. If you’re making a Mexican casserole, make two and freeze or refrigerate one. Instead of making one batch of baked oatmeal, double it and make two. Do your prep in bulk. Instead of making just what you need for one meal, prep or make for more than one. It saves you time later. When you’re chopping peppers and onions, chop two. When you’re shredding cheese, shred the whole block. If you’re browning beef for tacos Tuesday, brown enough for chili on Friday. Try batch cooking the same thing for breakfast all week – I did a whole post on this! It saves time both by limiting the time you are in the kitchen cooking, as well as the time to spend trying to decide what’s for breakfast each morning! I love one-pot pasta meals. I make these ALL the time. My best advice – search Pinterest and Instagram! Go to Pinterest and type in one-pot pasta or even search Instagram with #onepotpasta. I promise you will get TONS of pictures and ideas to inspire you. But for starters, check out my one-pot spaghetti for sure – it’s easy and delicious. Stacy asks: Do you worry much about where you get your meat? Pastured? Store bought? We just cannot afford high quality meat all the time, especially bacon. This is where I always say – your budget decides where you buy your meat. Does your budget have room for expensive meat? Do you the best you can with the budget you have! Some people have a big enough budget that they can always buy the highest quality meat available. But don’t feel pressured to buy more than you can afford. My Dad is a beef farmer, so we usually have beef from him, but if I run out before he butchers again, they I buy Aldi’s grass-fed beef. Since I can usually stretch beef more easily in recipes, I do always buy grass-fed beef. As far as bacon goes, we love Aldi’s nitrate/nitrite free bacon and for us, that’s a good compromise. It’s hard for me to afford to feed our whole family organic, local chickens right now. They can be so expensive! I used to worry that y’all would judge me if I admitted that I buy a rotisserie chicken from time to time. But y’all know what? I’m not ashamed – I love the rotisserie chickens from Sam’s Club! We can usually are able to stretch our rotisserie chicken out for 2-3 meals. We eat chicken the first night, and then I pick it off the chicken and save it from quesadillas, pasta, soup, salad, etc. Another way we can buy higher quality mean is by doing 2-3 meatless meals a week. It doesn’t have to be “health food”to be considered meatless or vegetarian. Tonight for dinner was Southern comfort food – macaroni and cheese with veggies. I get a lot of my meatless meal ideas from Budget Bytes. She has a huge selection of meatless, vegan, and vegetarian meal options. Every recipe I have tried from her site turns out delicious. Her Cheesy Vegetarian Chili Mac is UNREAL. Okay – your turn! What’s your favorite scratch cooking tip? !